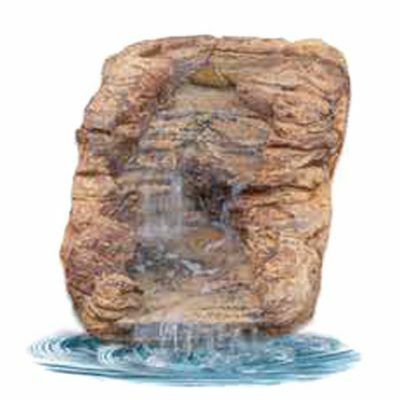 How long do Landscape Creations Artificial Rocks and Ponds last? These amazing rocks tested very positively under normal and even extreme weather conditions. They actually will react to the weather the same as natural rock. Natural mineral stains may form, and algae will grow if desired and create an even more unique piece. When constructing a water feature, you can use stainless steel screws to hold the pieces in position. You can also use a high-quality polyurethane adhesive to glue the items together and then apply sand or an oxide to hide the joint. With these simple steps we have never experienced the product blowing away once it has been laid in position. How hard are Universal Rocks to assemble? The hardest part of installing your waterfall is digging the hole for the pond. The product can be cut (with a bread knife) to fit into a restricted space, for example against a wall. Also, the waterfall and cascades can be cut so they fit over the pond and into each other. 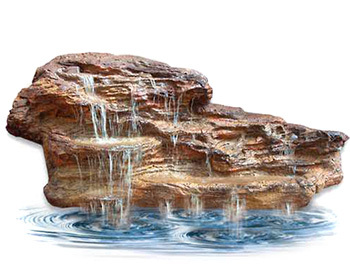 A entire line of rocks, waterfalls and caves have been designed specifically to overhang into a swimming pool. If these are used, a 40mm water outlet fitting is required as the waterfall is hooked up to the pool pump and needs a larger outlet to accommodate the pressure. Ensure that the pump is turned off when using shock treatment as excessive chlorine can bleach rocks. Does the waterfall have to run 24 hours? You can attach a timer to your pump so that it only runs at certain times. Remember though that stagnant water can begin to smell and mosquitoes can start to breed. An operating pump will help chew up and larvae to prevent this. Pumps are similar in cost to run as an indoor light. If you have a biological filter, you will need to run it most of the day. How do Universal Rocks compare with real bush rock? Lightweight, easy to move, durable and environmentally friendly. Authentic bush rocks are heavy and often inaccessible, with heavy machinery required to transport them. This limits where you can position them. 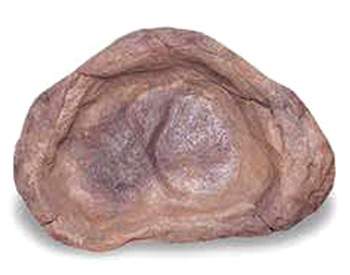 Bush rock can often crack over time due to contact with water. There are two types of ponds – clear water ponds and planted ponds. Generally, a clear water pond will grow algae quickly. Thankfully, there are natural anti-algae chemicals available. 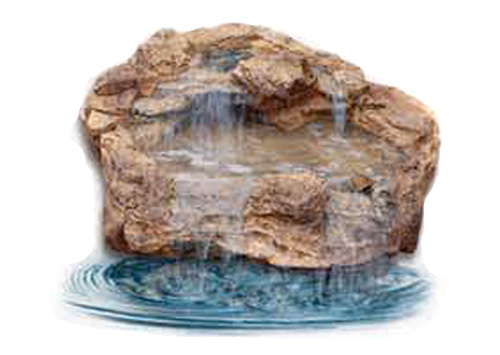 NOTE: Do not use chlorine in our ponds or waterfalls as it will affect your pump very quickly and could bleach the rocks. Planted ponds are very popular, however to control the water quality, the ecology has to be set up correctly. Your pond size will determine the amount of plants and fish etc required. There are two main types of plants required when setting up your pond. Decorative plants: Lilies, water fringe, nardoo, water poppy etc. These plants obviously make your pond attractive and enjoyable and they play a major role in the ecology of your pond. 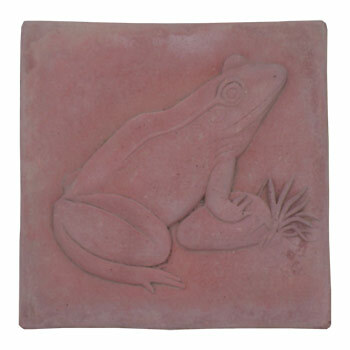 They provide a natural surface cover for your pond. You need approximately 70% surface cover for your pond. If not, too much direct sunlight will cause rapid algae growth. There are many types of filter systems, such as biological and ultraviolet that can be used. The pump however is primarily used to circulate the water flow. It has a sponge in the end, which is a large particle filter and needs to be washed out regularly. The ponds can be emptied and scrubbed if necessary – the pump can be used to siphon water out by removing it from the waterfall outlet and redirecting it to a drain. Yes. Fish and snails play a vital part in maintaining the cleanliness of a pond. The fish will eat the mosquito larvae and the snails are extremely good at cleaning the pond sides. Both these animals can be destructive if they breed to excess or grow too large. They can then start eating the plant life, which will cause the water to become dirty quickly.